The coneflowers and other flowering plants in the perennial garden are full of life: skippers, bumblebees, other various bees and flies, and today a spider. 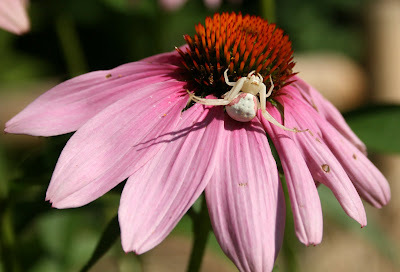 A beautiful white spider with pink bands. Isn't she beautiful? At bugguide.org I keyed this to a goldenrod crab spider, Misumena vatia. Apparently this spider can change color over several days from white to yellow depending on the color flower that it's sitting on. This spider, looking like a crab, lies in wait for its prey - unwitting flies and other insects; it does not build a web. Walking around the yard in the late afternoon, collecting Japanese beetles in my yogurt container gets tiresome and discouraging sometimes. Just when I think I've nipped them all, I find bunches more. Then there are the tomato hornworms, at least 3 each day to dispatch. My mood brightens though as I approach the coneflowers as this is where I find lovely bees and butterflies and other cool insects. So it was today. 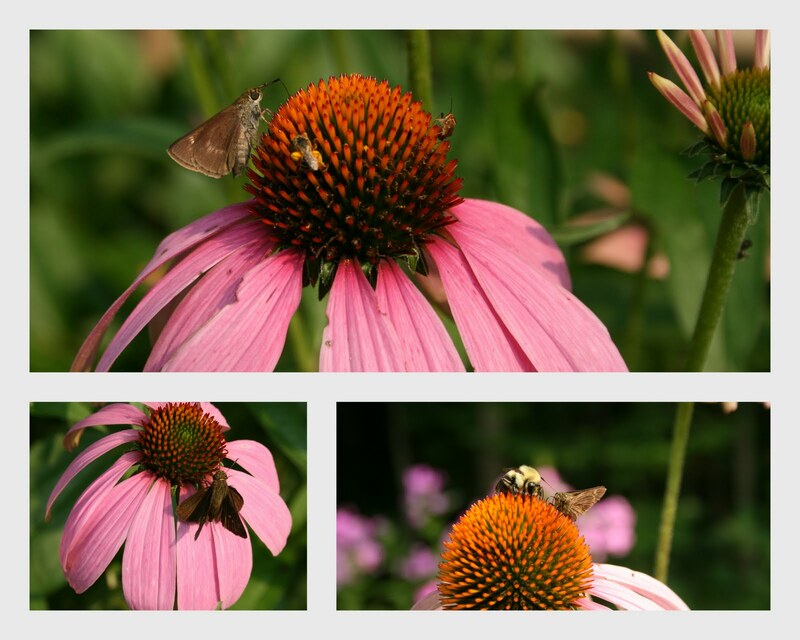 I saw a new butterfly on the purple coneflower and dashed back in the house for my camera. It looked like a different species of skipper - a big one. After a review of the Internet, I keyed it as a silver-spotted skipper, Epargyreus ciarus. Note the gold spots on the forewings and the silvery-white band on the underside of the hindwing. Somewhere I read that the silver band looks like the State of Texas (the "silver star" state), hence its name. I'm not sure. This is the largest skipper (about a 2 inch wingspan) and apparently quite common. 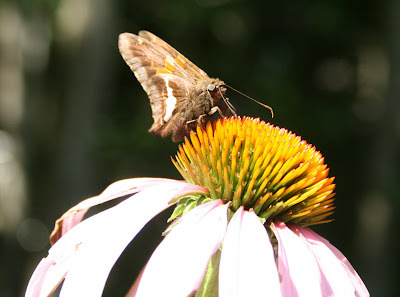 Have a look at its huge eyes and large proboscis, features common to all skippers. The translucent gold spots on the forewings resemble a stained glass window as the late afternoon sun illuminates the garden. About 2:00 in the afternoon yesterday, at the peak of the heat, when the thermometer read 99.8 F, Kodi decided he wanted to go outside. He actually flopped down in the lawn, under the hot sun, for awhile. 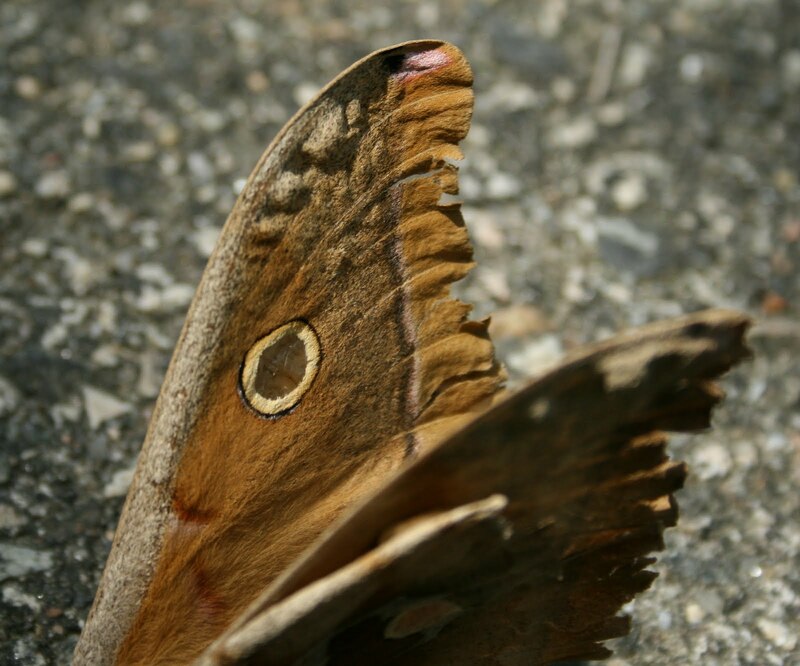 I noticed some dead leaves in the driveway, then realized it was a big moth with a 4-5 inch wingspan, a polyphemous moth to be precise. The moth looked a little tattered and was sluggish, as these giant silkworm moths tend to be. With these species' it is all about the caterpillars. The adults do not feed, rather they spend their week or less of life, mating and laying eggs. This one looks like a female. 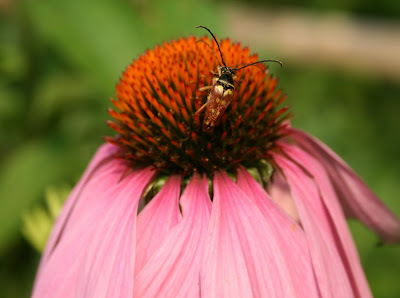 Males have much bushier antennae, which they use to smell female pheromones. I moved the moth to the shady lawn at the edge of the woods. There it spread its wings, displaying a beautiful set of "eyespots" on the hind wings. The moth will flash these owl-like "eyes" to scare potential predators. The dead leaf look when the wings are closed offers more protection, hence my initial thought that it was a pile of leaves on the driveway. Although a "silkworm" moth, along with the well-known luna moth and cecropia moth among others, these American silkworm moths are not the source of silk. Attempts at harvesting silk commercially from these moths has apparently failed. 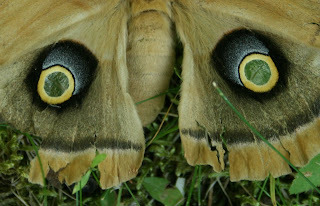 Silk for textiles comes from the Silkmoth, a member of a related but different family. Regardless, all the silkworm moths are gorgeous - keep an eye out for these giants. Kodi figured it out this morning. While I was watering the vegetable garden he dug a cool spot at the edge of the perennial bed. 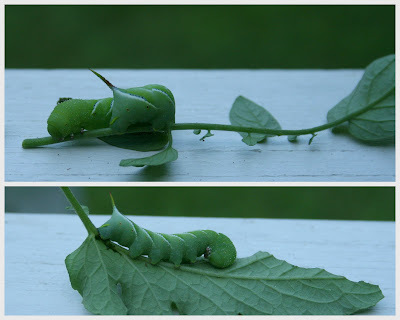 As I was watering the tomatoes, I noticed the first two tomato hornworms of the season. I always dread finding these, because it's a little icky to squish them, so green and juicy they are. On a sweet note, this is the best year for our six blueberry bushes. We manage to harvest a small crop each day - enough for granola and ice cream -- before the birds and chipmunks find them. Kodi is indifferent to fruits and vegetables, so we don't worry about him nibbling at the bushes. Our previous dogs loved fruits; they would pick blueberries and raspberries straight from the bushes. 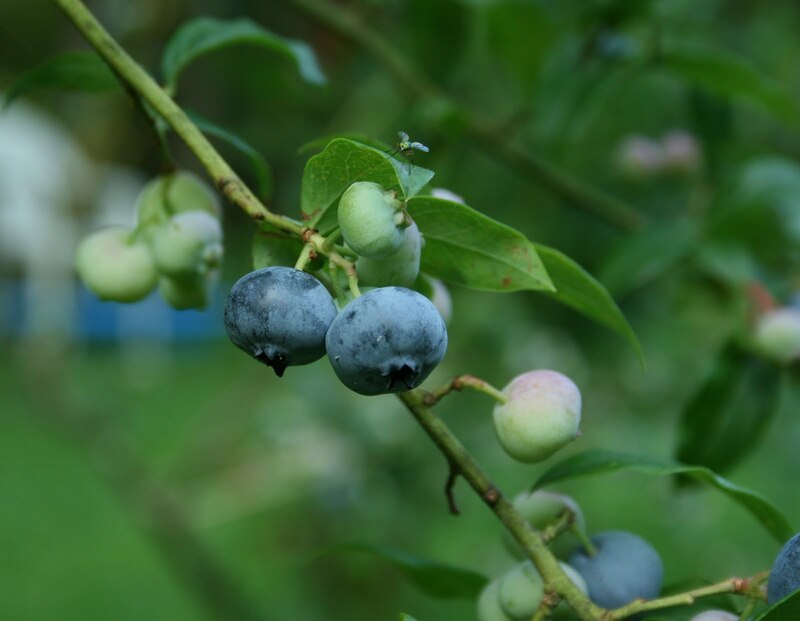 We've also picked gobs of blueberries from Inkwell Farm, a nearby organic farm that is loaded with berries. Mid-July mornings are busy, especially when the temperature and humidity rise quickly each day. It is best to get the gardening done early. Fortunately we got a bit of rain yesterday, so the gardens did not need watering. This provided time for new plantings of sugar snap peas, green beans, cilantro, spinach, and arugula. Then to harvesting cucumbers (these are coming on strong), zucchini, patty pan summer squash, lettuce, and a few sun gold tomatoes.The green beans are full of blossoms and a few beans are forming. The okra is a bit stunted, but starting to form small fruits. After planting and harvesting, I walked around the yard with the water-filled yogurt container collecting Japanese beetles. The numbers are declining so I am hopeful that I'm getting ahead of them. 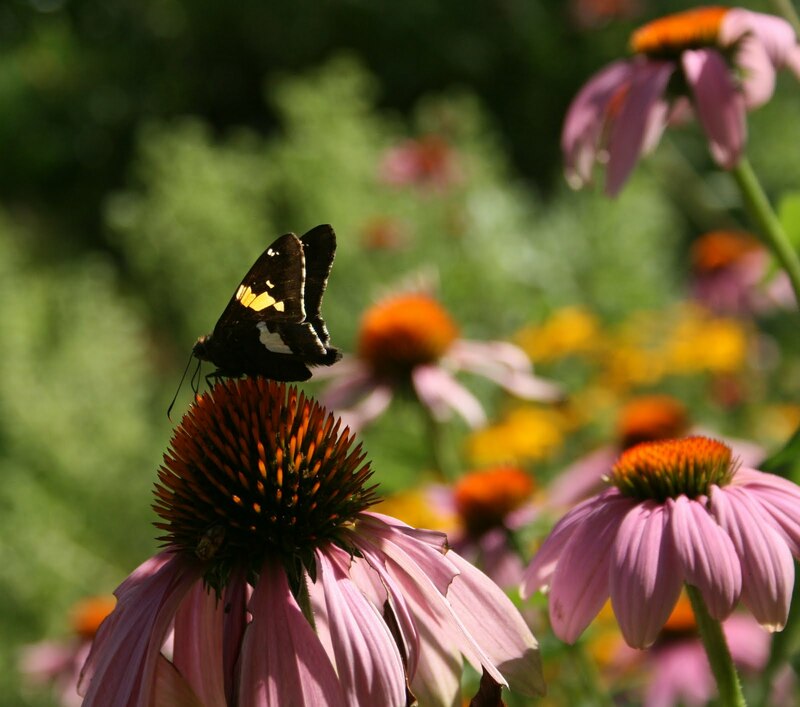 They favor certain plants: hazelnut bushes, evening primrose, blueberry bushes, and a smattering of other plants. At least I know where to focus my energy. In the morning and the evening the beetles are quite sluggish and easy to gather. Then I paused to enjoy the purple coneflowers bathed in morning sun. 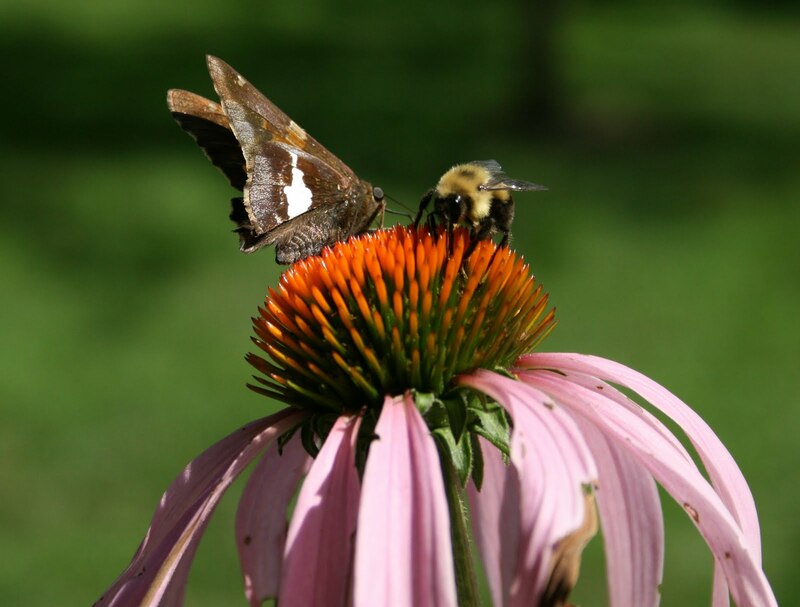 I love watching the pollinators at work; they were all busy this morning, sharing space on each flower with one another. Here is a collection of the bees, flies, beetles, and butterflies at work this morning (click to enlarge). Kale must be one of the easiest vegetables to grow. It lasts from spring to fall and even into winter. We use it in recipes that call for spinach, which seems much harder to grow in our summer climate. 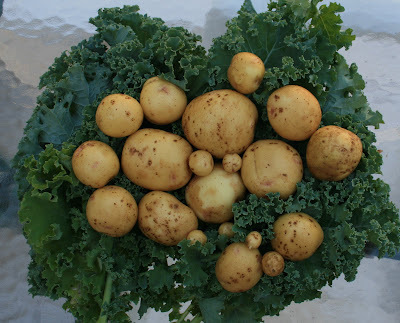 And now that we grew potatoes for the first time, kale and potatoes are a perfect pair. Yesterday I dug up half our small patch of potatoes -- a small but terrific crop of Yukon Golds -- and picked a handful of kale. With my in-laws from India here for an extended visit, we are preparing mostly Indian vegetarian meals. My mother-in-law cooks without recipes, but I rely on a few cookbooks. A favorite is Madhur Jaffrey's Indian Cooking. 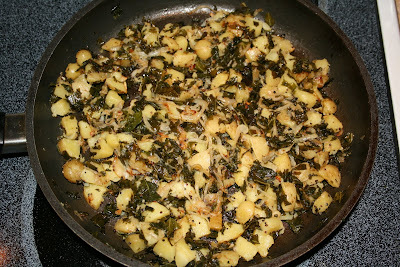 Jaffrey has an excellent spinach-potato (Saag aloo) recipe in which I use kale instead of spinach. 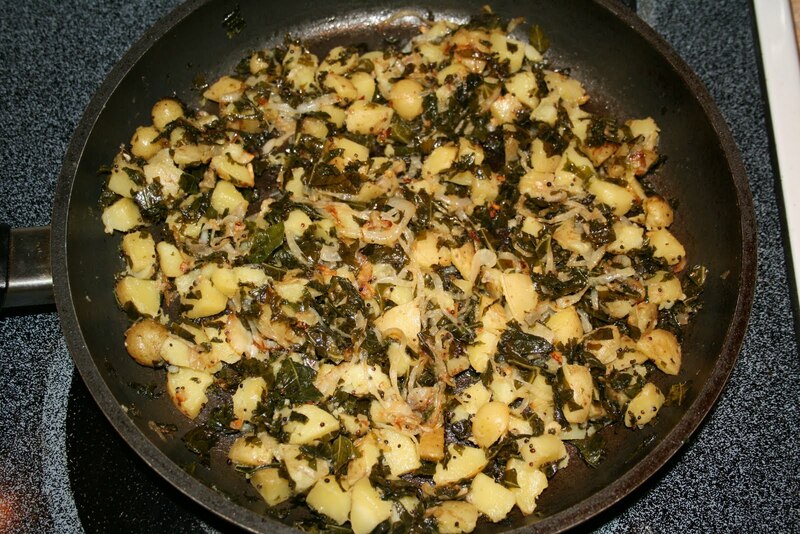 The coarser kale actually goes quite well with the starchy potatoes. The recipe includes cubed potatoes, chopped kale, one onion sliced thin, a few garlic cloves minced, salt, black mustard seeds, and a pinch of ground asafetida (a common south Indian spice). Essentially you saute all of this, starting with the asafetida and mustard seeds added to a few tablespoons of vegetable oil heated in a saute pan. Add each ingredient and cook with a little water for about 20 to 30 minutes, salt to taste. Yum. I spent yesterday walking with a landowner on her family land, which sits on the lower slopes of the Doublehead mountains along the East Branch of the Saco River in Jackson, New Hampshire. While it was beastly hot and humid elsewhere, we enjoyed a slightly cooler day on the wooded slope, beneath huge hemlocks, white pines and birches and in butterfly-friendly meadows of milkweed, goldenrod, and other wildflowers. On the drive home, I thought how fortunate I am to visit interesting people and interesting lands across New Hampshire. Yesterday, under hazy skies we climbed uphill into a cool (in temperature and in scenery) spruce and fir forest, listening to warblers and thrushes and talking about the history of the land and the lives of the trees. At midday we hiked through one of the meadows back to the house for lunch as barn swallows glided overhead and swooped down to the pond for a meal. My host took me by the pond to show me a small treasure left behind on the swimming dock. Only a kindred spirit would show me a lump of vomit left behind by a great blue heron. This bird had fed in the pond the previous night and roosted overnight on the dock. Before flying off in the morning it regurgitated its last meal. We pulled it apart for a closer look. Here, take a look, what do you see? Those are five intact (but dead of course) red-spotted newts and maybe a bit of fish. The heron would have swallowed a tasty fish, but the batch of newts ruined the meal. Newts have slightly toxic skin, a somewhat effective defense mechanism, except in this case. We saw a heron lift off from the pond later in the day; it looked like a young bird, perhaps inexperienced in the ways of safe foraging. The red-spotted newt is the adult stage of a salamander that starts out as an aquatic larva, then changes into a juvenile "red eft" stage and moves to land, where it spends a few years (sometimes up to 7 years) out of water. Eventually the eft returns to a pond and matures into the aquatic adult newt stage. 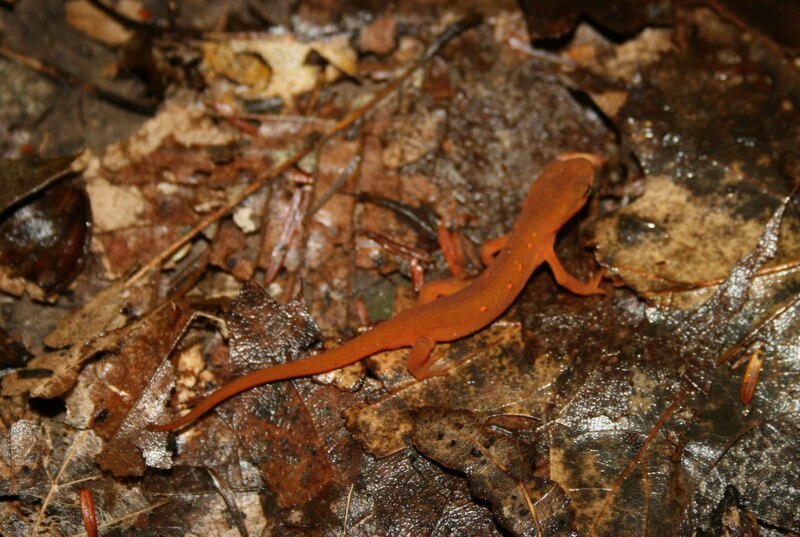 The red eft and the adult newt have red and black spots. The adult newt is typically olive green, while the eft is often bright orange and is a common sight on woodland trails especially after a rain. I look forward to my next adventure with landowners in the New Hampshire outback. One of my next stops is a property that was seized by federal agents a few years ago, as the then landowner was caught growing marijuana. One of my responsibilities is to help the current landowner decide if the pits dug for growing marijuana should be filled in and restored to the natural surrounding woodland. Stayed tuned for that adventure. I planted potatoes for the first time this year. Today I dug one plant to see what was happening underground. 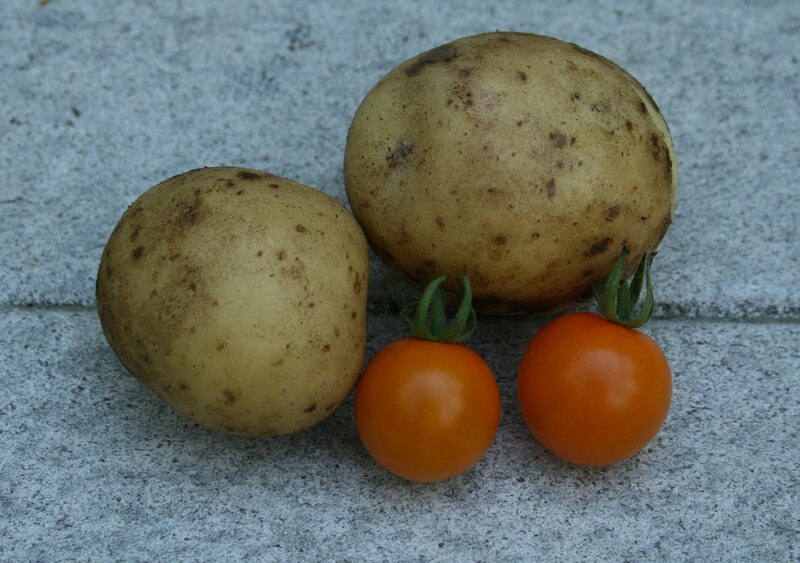 I proudly present my first two potatoes, along with the first two Sun Gold tomatoes of the season! We've been using the last of the garlic bulbs from last summer's harvest. By now the garlic cloves are rather dry and much less flavorful. Garlic scapes -- the curly flower stalks -- have served as a stand in, but still not quite the full flavor of a fresh bulb. So, when I visited my parents at Winterberry Farm the past two days I pulled a few bulbs of the new crop. Aren't they beautiful?! In another few weeks we will harvest the whole crop of nearly 400 bulbs, with the biggest bulbs saved for the fall planting. Look for the next quiz in August; the topic is feathers. As a teaser here is a pile of feathers left behind, perhaps by a Cooper's hawk. Who do the feathers belong to? Just as I was about to post this blog, I discovered a cool website hosted by the U.S. Fish and Wildlife Service -- The Feather Atlas. You can use The Feather Atlas to figure out this species and then try to determine if the feathers in the picture are wing feathers (primary or secondary) or tail feathers, or maybe some of both. You can learn how many tail feathers most birds have and so much more. How cool is that! 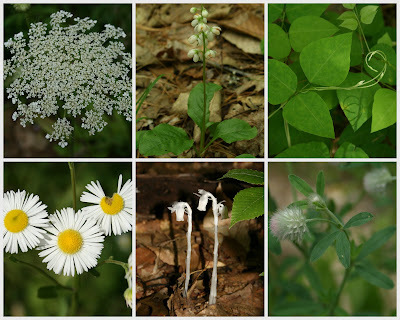 It is summer vacation for some, which seems like a good time for a plant quiz. I do believe that the last plant quiz was way back in January, so we completely missed a spring plant quiz. Here we go then with some easy summer plants. I picked six plants that I've seen around here in the last week or so. I also like their individual names - names that give you clues as to which is which. 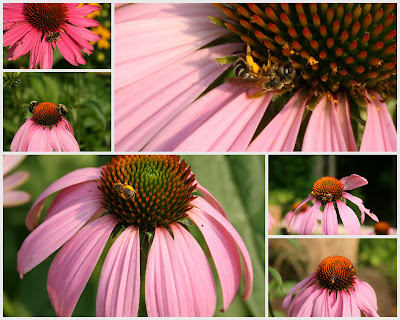 This is a simple quiz: match the following names to the plant photos below. Good luck and I'll be back with the answers on Tuesday. Indian pipe, hog peanut, Queen Anne's lace, rabbit-foot clover, daisy fleabane, and shinleaf. 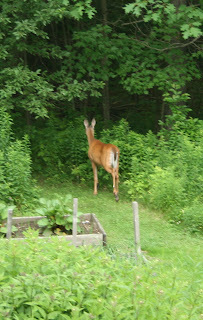 A healthy looking doe wandered up our woodland path and into the edge of our backyard meadow at about 6:30 last night. She nibbled on the tall grasses, occasionally glancing toward the house, her big ears straight up. She seemed unconcerned as we stood on the deck looking back at her, even with Kodi next to us. After a few minutes she turned slowly and stepped softly back into the woods. She was only a few steps (and nibbles) away from the three raised garden beds. Knowing that deer venture into the backyard we planted rhubarb, onions, squash, and cucumbers in the raised beds, assuming deer would avoid those plants. So far, so good. The sweet tasting foods are in the fenced-in garden in the front yard. Last night we enjoyed our freshly picked spring broccoli and sugar snap peas. The doe would have enjoyed those too. One small creature though is mercilessly pestering the cucumbers, squash, and melons -- the striped cucumber beetle. These striped beetles are quick and small, but I am just as mercilessly squashing them. My in-laws from India have arrived so we are cooking up delicious vegetarian Indian dishes with our fresh garden vegetables. This morning my mother-in-law and I picked 15 pounds (about 12 quarts) of sweet strawberries at a local farm. The weather this week is perfect for strawberries - dry and not too hot. We tried growing a small patch of strawberries in our yard a few years ago, but the birds and chipmunks ate most of them. So, we leave it to the bigger growers to supply the strawberry picking fields. Now to keep Kodi away from the blueberry bushes.